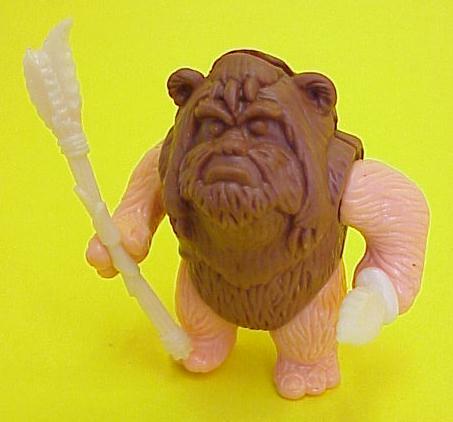 Kenner planned to release six new characters for the vintage Ewoks cartoon series: Chief Chirpa, Bondo, Morag, Chituhr, Paploo, and Weechee. Although the figures were not released at retail, the production molds were created as evidenced by this Weechee first shot. Remarkably, both accessories are present with this figure; an aspect of extreme importance to unproduced Droids and Ewoks collectors. 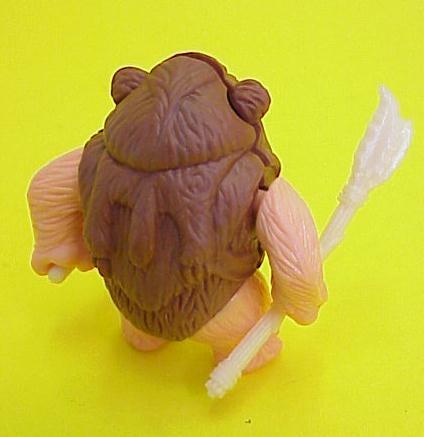 The second image affords a glimpse of the figure from the back side. Unlike a production quality figure, this example lacks any copyright or country of origin markings. That information is etched directly into the steel molds after preliminary mold tests are complete. The torso can be taken apart since this figure has not been exposed to the sonic welding process, which fuses the two torso halves together.